The dangers of artificial sweeteners are that they are some of the worst frankenfoods on the market. By that I mean they are so chemically altered that our bodies do not recognize them as food. The only thing worse than too much sugar for your health may be fake sugar! Some artificial sweeteners are worse than others to be sure and it's also a matter of how frequently you eat these things. If you are pregnant don't consume them at all and they shouldn't be given to children. Are you just eating a packet once in a while or do you drink diet sodas every day? Nobody really knows for sure what reasonable consumption of diet sodas is but occasional is far better than daily and one a day is better than several. These "sugars" are in every diet food product known to man - thousands and thousands of products contain these chemicals. The sad thing is everybody's just trying to avoid sugar...that food substance that leads to obesity, right? It's not fair. If you are diabetic you can be aware of the glycemic response of sweeteners and make up your own mind as far as the safety. Do they have high glycemic additives like maltodextrins or dextrose? You need to read the labels. Equal and Sweet N'Low, in individual packets, contain dextrose with maltodextrins. These are high glycemic additives. Other artificial sweeteners with these high glycemic additives include: Sweet Thing, Sugar Twin Brown Sugar Replacement and Splenda. Aside from the high glycemic issues there are other dangers of artificial sweeteners. Not all the artificial sweeteners will raise your blood sugar but they can do worse things. The side effects range from headaches to cancer or seizures. Since these artificial sweeteners are in thousands of "diet" products from sodas to all kinds of processed foods, it's possible to be ingesting large amounts of these chemicals over time. The worst of the lot is probably Aspartame/Nutra Sweet. It's the artificial sweetener that is most widely distributed. It should not be given to children and is widely known to be disruptive to the brain. It is known to cause headaches and irritability. It’s been on the market since the 1980s and worse adverse reactions to it are well documented. It has come under heavy criticism for it’s use by many scientists. headaches/migraines, dizziness, seizures, nausea, numbness, muscle spasms, rashes, depression, fatigue, irritability, tachycardia, insomnia, vision problems, hearing loss, heart palpitations, breathing difficulties, anxiety attacks, slurred speech, loss of taste, tinnitus, vertigo, memory loss, joint pain, weight gain. If you have a serious disease, disorder or neurological condition it could trigger symptoms and make it worse. Saccharin and Cyclamate have been around for decades but lost favor in the 1960’s. That’s when testing was done with them that showed they caused tumorous growths in animals! Both sweeteners were then banned from the market in Canada and the U.S. The ban for Saccharin was upheld in Canada but pressure was brought to bear by the public in the U.S. to lift the ban. Diabetics wanted to have access to it regardless of the risks. So it is available now with the health risks on the label. Acesulfame K is similar to Saccharin with the same cancer risks. Sucralose is sold as Splenda and it may be the most chemically foreign for the human body and therefore the most difficult to digest. In fact, it doesn’t seem to be absorbed at all. Who knows what the long term affects will be? Apparently it is 600 times sweeter than sugar. Splenda is another one that exemplifies the dangers of artificial sweeteners. All of these artificial sweeteners are far sweeter (sometimes several hundred times) than sugar. In fact, their caloric effect is about the same as sugar but you need so much less of it (and they taste so bad) that they are very alluring for dieters and diabetics. It’s a shame that marketers target people who desperately want to control their cravings for sweets. They may not be as concerned about the health risks because they are more worried about their weight! Another danger of artificial sweeteners is that they desensitize our taste buds in the way that too much sugar does. People seem to get as addicted to diet cokes as they can to real cokes. For more information about the serious harm artificial sweeteners do you can read Excitotoxins: The Taste That Kills by Russell Blaylock, a professor of neurosurgery at the Medical University of Mississippi. Now that obesity is such an epidemic there are more people who need to curb their sugar intake. 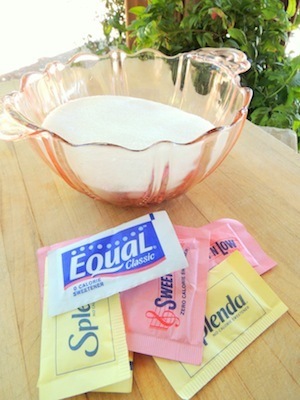 Artificial sweeteners are made from crystalline powders in a laboratory. The dangers of artificial sweeteners are that they are as addictive as sugar and even more detrimental to health. Even though scientists concoct them from “natural sources” they are combined into a group of chemicals that the body doesn’t know what to do with. The marketing of these sweeteners is fierce and their relative safety is hotly debated among scientists. Certainly it's wise to err on the side of caution and seriously limit or better yet eliminate the food products that contain artificial sweeteners. It’s better to stick with a low glycemic food plan that reduces your desire for sugar and to use low glycemic sweeteners for natural sugar substitutes. Check out the articles below for more information about permanent fat loss! Here's the straight scoop on actual serving sizes and some biochemically perfect low glycemic snack suggestions. A week's worth of low glycemic menus with lots of recipes so you don't have to figure it out. What nasty stuff to look for so you can throw the food back on the grocery store shelf and move on. You didn't think you had to keep it forever did you? Say goodbye to these foods - it's not hard if you value feeling like you can take on the world. These are the truly nasty ones that will lead you astray and into an early grave (or at least into feeling terrible...eventually.) Not to mention keeping you fat. Return from Dangers of Artificial Sweeteners to Calorie Counter. Return from Dangers of Artificial Sweeteners to Lifetime Fat Loss home page.